I departed to India on February 19th from Birmingham via Dubai, arriving Kolkata next morning at 7.30 am. I met Indrajit of Saving Tiger Society at the airport and we made our way to the Sundarbans project area, arriving there early afternoon. After meeting all the Saving Tiger Society team, I took some rest for a couple of hours, as I was not feeling well due to a cold virus and also a twisted ankle which I had done back in the UK, whilst walking my dogs. I had an energy drink, salt and sugar in water, which helped for hydration after waking up and it also settled my stomach. 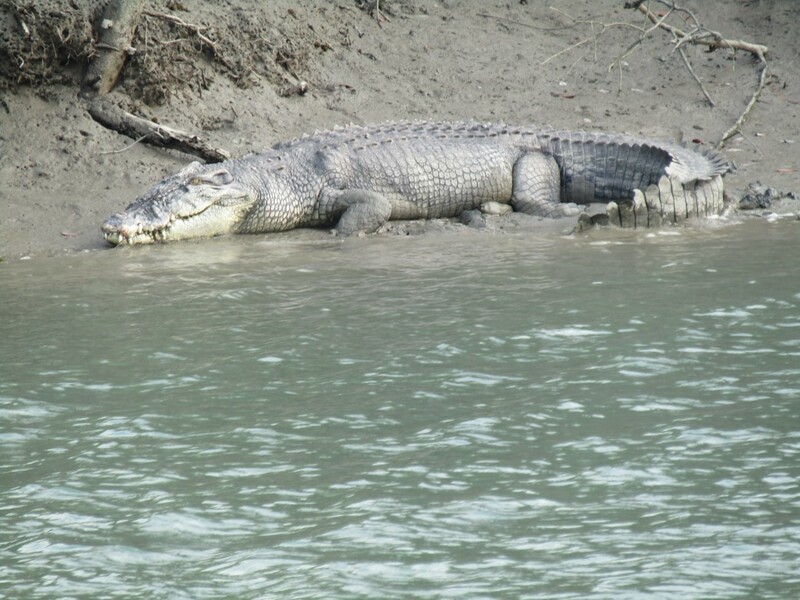 Next morning, we took the students from our school, with the staff on a nature trip in the Sundarbans, total of 75 people. This allows the students to see nature for themselves, we try to do this twice yearly, it’s the final step after having talks and seeing films, to experience it for themselves will add to their education and knowledge. 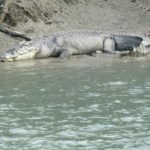 We visited Dobanki and Sudhanyakhali camps, the students observed whist on the trip, crocodile, wild boar, chital and many birds. 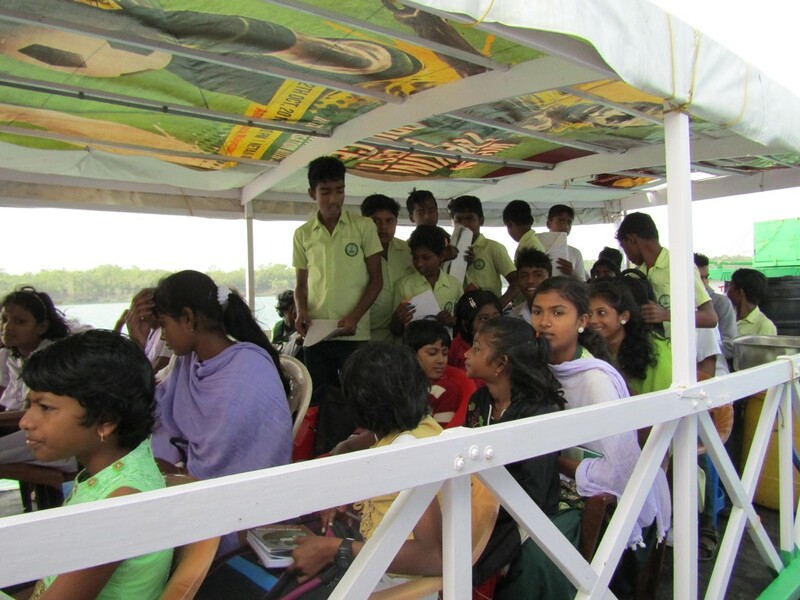 Later in the afternoon, the students and staff boat took them back to the local jetty and they made their way home, we were stay out on our boat for the next few days, visiting various areas and villages. Next day, we started early in the morning, going around the forest areas of Pirkhali one, two, etc. We observed fresh Tiger pugmarks on one side of the forest where it had crossed over the river, we also observed some crocodiles and many birds. In the evening, Saving Tiger Society gave some solar lights which had been donated to the village of Dayapur, the villagers contributed towards the cost of the solar lights, which in turn, was given to the company in Maharashtra that had given the lights, to help towards the wage costs by the company, overnight we stayed on the boat at Pirkhali. Next morning, we started early again, after collecting our guide, to visit other forest areas, over the visit in these areas, I noticed more plastic than other visits, such as plates and bottles. In the afternoon at Pirkhali 7 we observed a male Tiger crossing four different creek areas and walking by the side of the river in a forty minute period, this was my first Tiger sighting in Sundarbans, it was such a fantastic sighting, we also captured some good video footage. In the evening, we dropped off by the boat at Basanti, we were due to stop out a further night and go to other village areas, though due to the choppy water, the boat pilot suggested it was not a good idea, we returned to camp by car. Next morning, we visited the Learning Institute in Narforgunj, we also organised our flights with a local travel agent to Nagpur and Delhi, which was later in the visit. In the afternoon, I gave a bonus to nine of the Saving Tiger Society staff for their hard work over the year. In the evening, we visited Tridipnagar Tiger Squad team, they are the most senior of the teams, started 3 seasons ago and also in age, as it is made up of 10 mature people, as in this area, the younger people are not interested in joining the team. We had a meeting first and then patrolled 50 percent of their duty area with them. 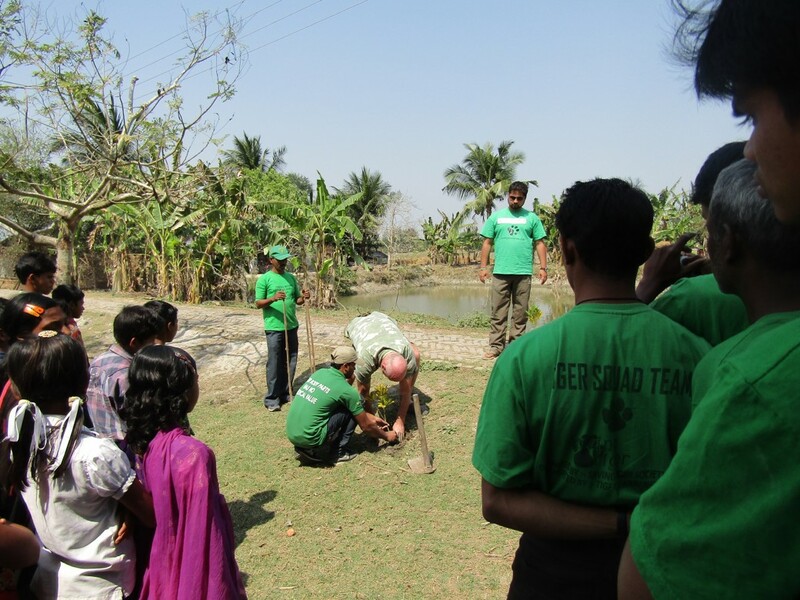 Next day, we went to Gangamela for the afternoon and did a nature camp. 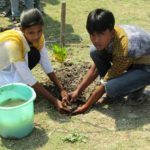 There was 60 plus children attend and 20 adults involved, there was some planting of some trees, litter collection in the area by the children and a presentation by 2 Saving Tiger Society members on snakes, after the presentation, they had some food. 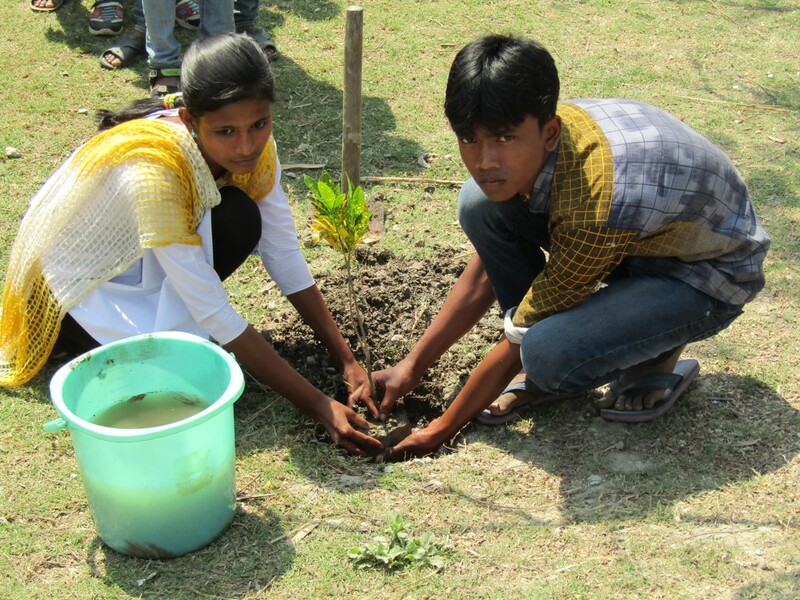 Sunday (February 26th), we had a Wildlife Conservation Day, which was organised in Narforgunj by Saving Tiger Society, we took part in a 3 km march from the school project area to the Nilkanthapur Prathamik school, who hosted the event, the students had a banner and placards with conservation messages on the march. Once we had arrived at Nilkanthapur school, we were also met by a German friend and 15 children from Tilja Shed an organisation for under privileged children from Kolkata, they were to spend the day and most of the next day with us. After the initial introductions, there was a nature film showed to the students, they had lunch and then there was a drawing competition and prizes given for the best judged drawings. The children from Tilja Shed stayed overnight at the school project area, they had the chance to play football and badminton with some of the local villagers and staff. 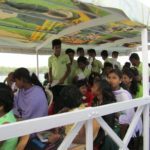 Next morning the children of Tilja Shed and Andreas were taken on a boat that had been organised for a couple of hours, so they could get to see some of the Sundarbans, they observed many different birds on the visit also. In the afternoon, I had a meeting with the Saving Tiger Society team, short time after that Andreas, the teachers who had accompanied them and the children gave us a presentation on Tilja Shed and their work in Kolkata, a short time after that , Andreas and the children had to return to Kolkata by car. Next morning, we made our way back to Kolkata also, as in the late afternoon, we had a flight to Nagpur (MP). 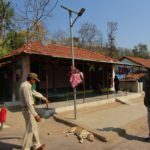 We arrived in Nagpur at 19.30, our car was waiting and took us to a rest house in Pench, early hours of the morning, two of the Saving Tiger Society arrived. Next morning, we had a meeting with the Field Director of Pench, discussing about future works in the area. We explained that we would be looking to put more boundary walls around open wells in Pench Buffer area from the end of March onwards. We also left him with 10 solar Fox Lights, these are lights that flash intermittently and can be used on the edge of villages or crop fields to keep herbivores and predators away, these have been used in Africa successfully, the Field Director, said they would use them in a village in the buffer area and give us feedback. 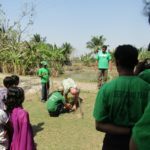 After we visited some wells in the buffer area, that need concrete boundary walls around them, at present, some had brush and branches around them to stop anything falling into them. In the evening, we visited one of the animal squads (Paraspani), this was one of two that are active and we are supporting in the buffer area of Pench, they patrol at night to help reduce crop raiding, which Tiger also follow, they also look out for electric cables that might have been dropped to use to electrocute wildlife, this has stopped in the area, whilst the team has been active for the last 9 months. We gave the 6 team members, 2 k Rupees as a bonus for their duty, soon, we hope to give an improved daily wage for all the team members, it was also suggested to increase the team to 10, to allow then to have more quality time in the area and split into 2 teams of 5, we then went on patrol duty with them and the local forest ranger. Next morning, we visited Pench Tiger Reserve (Kamajhiri Range), we observed chital, sambar, gaur, wild boar, nilghai, wild dog and many bird species, including vultures, we heard alarm calls, though no sighting of Tiger / Leopard on this visit. After returning from the forest, we had some breakfast then made our way to Kanha National Park via Seoni. 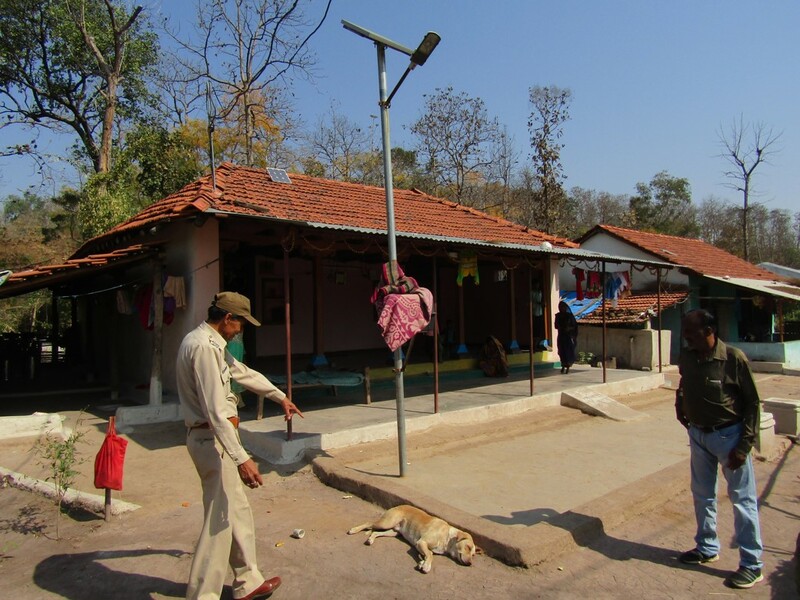 On arrival at Kanha, we were staying at a forest rest house at Kisli gate area. In the early evening, we had a meeting with Mr Shukla, the Filed Director of Kanha National Park, before going to bed, we could her a Tiger calling Aooowwm, Aooowwm in the distance. In the morning, we visited the forest area, we observed, many herbivores, such as barasingha, chital, wild boar, though no sighting of Tiger / Leopard, though we did observe Tiger pugmarks, as we were leaving the forest area. After breakfast, we went to take part in a cattle caretaker program at Katia office, that we had help fund for the equipment given to the cattle caretakers. There was a power point presentation by the forest dept on why they are doing the program and the benefits. There were 150 chosen villagers, they would be able to graze cattle in designated areas and this would be monitored by the dept and the main benefits are that it will reduce man animal conflict, loss of cattle and the villagers taking part could pass on any illegal wildlife activity information to the dept and they would get some compensation from the dept. 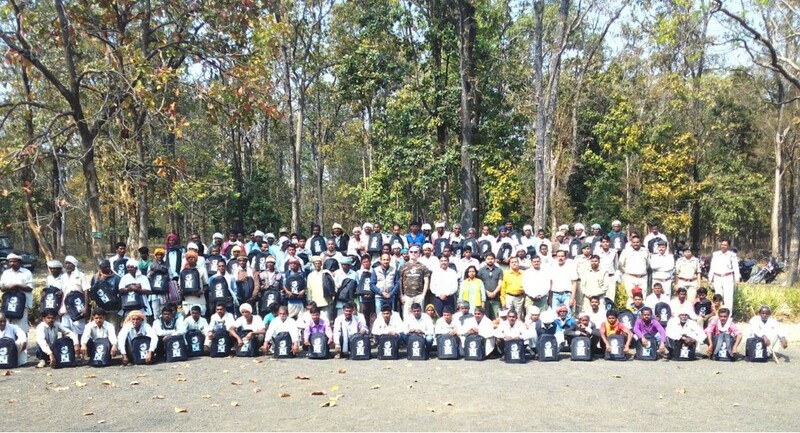 We had funded jackets, back pack, water bottles and torches for all the 150 cattle caretakers. After the program was complete, we visited the forest area again for a couple of hours, again we observed many herbivores, though no predators. It was felt, since the dept had been fire line burning in recent days, it was disturbing the movement of some wildlife, including Tiger and Leopard. Next morning after visiting the forest area, in which again, we had no sighting of the big cats, despite alarm calls close by. We made our way to Satpura by car, stopping of in Jabalpur, to drop off the 2 members of Saving Tiger Society at the train station who were to get the train a few hours later to Howrah (Kolkata), this would be a 36-hour journey. We continued by car for another 6 hours arriving at Mutkuli forest rest house just before midnight. In the morning, we visited 3 villages that have been relocated 30 kms from inside the Satpura Tiger Reserve, they have improved amenities now, such as electric, water, brick buildings and better quality of land, medical facilities and education are close by also, none of which they had when they lived in the Tiger Reserve. 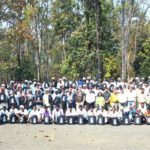 The villagers said that were happy that they had relocated from the forest area, they had a good relationship with the forest department staff that helped with their relocation also, which was very encouraging. After visiting the villages, we made our way by car to Bhopal. Next day in the morning, we had a meeting with the Chief Wildlife Warden (CWLW) of Madhya Pradesh on current and future support in the state. He then came with us to visit the 4 Belgian Malinos dogs in training at the police training centre. He was impressed with the dogs, we watched them in their training, finding wildlife body parts in cases, catching and tracking poacher suspects. We met the handlers and gave them canine first aid kits, which we had purchased, these will be useful in the field, until veterinary care can be given. The dogs are progressing well, they have grown a lot since October last year, when we visited last, they have about another 6 more months of growing to do before fully grown, there training is due to be completed in July, though we were told they might bring that forward to May, as they are progressing well and will be a great asset in the field for anti-poaching and security. In the evening, we took a flight to Delhi from Bhopal, we stayed in a hotel close to the airport, as our flight landed at 10 pm. Next morning Indrajit, took a flight to Kolkata and in the afternoon, I had a flight to Dubai, then onto the UK.